Silver Monkey is back, and he wants the Soultaker Sword, but Katana is not willing to give it up without a fight. Alongside the League of Assassins, Silver Monkey kidnaps Bruce Wayne with plans to hold him for ransom – his life for the sword. When Katana shows up to turn over the sword and rescue Wayne, Alfred causes a diversion, allowing Wayne to don the Batsuit and join the battle. Teaming up with Katana to fight the League, and Lady Shiva, Batman finds himself in an all-out ninja fight. After a “previously on Beware The Batman” we go straight into the episode. The opening is wonderfully done; it is slick, speedy and with an excellently animated battle sequence which sees Batman and Katana defending themselves against an army of Ninjas. This is the hook for the rest of the episode, the thing that keeps the audience watching. We want to know how and why the characters got into that situation and whether they will get out of it. Unfortunately on a second watching the episode does not stand up as strongly as on first viewing. The story mainly centres on Silver Monkey (of ye olde League of Assassins) attempting to get The Soultaker Sword back from Katana. After kidnapping Bruce Wayne, Katana turns up to rescue him. Subsequently faking his death in front of Katana and Silver Monkey, Bruce puts on the Batsuit and joins the ensuing battle that we saw at the beginning. 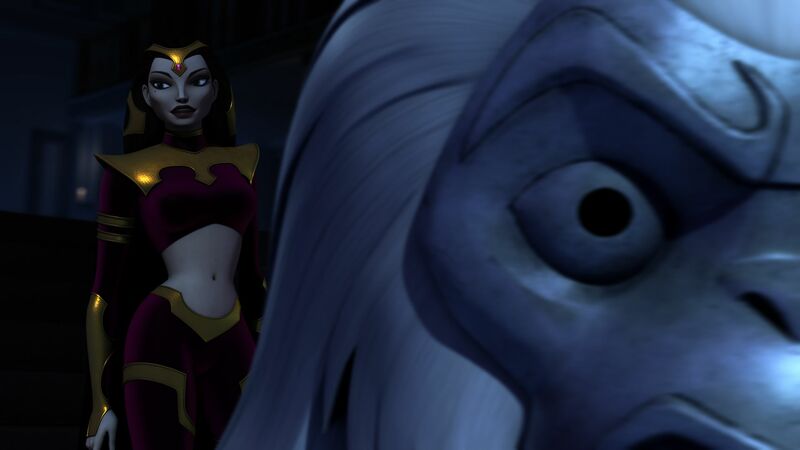 Following his capture of our dynamic duo Silver Monkey is about to leave, however Lady Shiva appears and takes Silver Monkey down for betraying her. Batman then destroys the building and escapes with Katana. However they lose The Soultaker Sword to Shiva. Going back to the BatCave, Bruce reveals he is Batman and tells Katana that this was her final test and that she is now on the team. Rather like the previous episode to feature The League of Assassins, Safe, this episode feels too action packed. Of course there should be some action on Batman episodes but when most of the episode is like Mortal Combat, I think it is safe to say that the plot needs rewriting. Another niggle is that this episode is once again an arc episode and it feels like the writers want to advance the story arc but don’t seem to know how to. Rather than, like with other episodes, putting in little hints and mentions on what has previously happened, with the arc heavy episodes, it seems to lose the subtlety and instead plonks big updates of the storyline into the episode. Beware The Batman, Family feels like the writers are copying the same “League of Assassins turn up, stuff goes down” type plots for arc heavy episodes. It is lazy writing and hopefully the next episode will have more plot or be character driven as opposed to arc driven.